It’s always nice to come up with an outfit from existing things in your wardrobe, especially some that you’ve had for quite a while. Nothing is new here, and the oldest pieces are either my chambray shirt or my all-time favourite brogues, the neon coral pair – I know for a fact that they are older than the blog itself (they came on holiday with me to San Francisco in 2011 and I set up the blog soon after I got back: here’s my first post)! 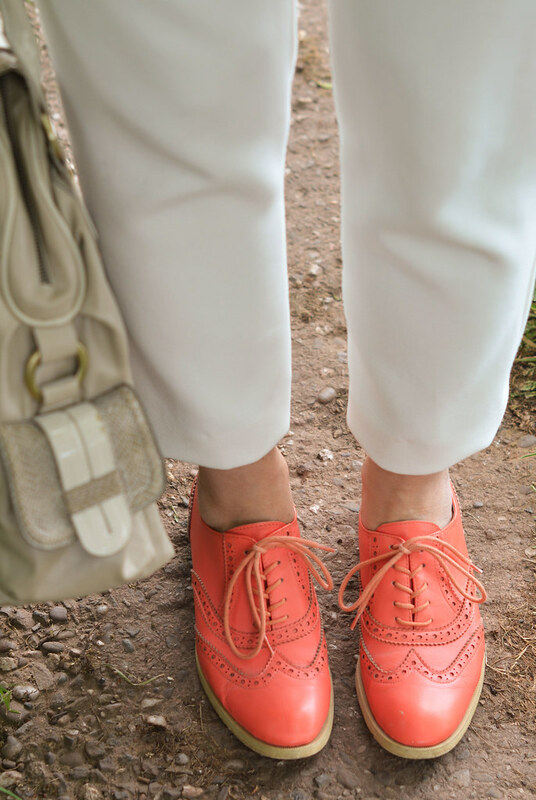 The brogues add the perfect dash of bright colour to an otherwise neutral (but very spring-like) outfit of all white and light wash denim. Although I wear them a lot, the last time they appeared on the blog was two years ago, but I think the white and silver brogues have become their nearest rival in recent months. Both are insanely comfortable and more interesting than your average brogue. Which of these two brogues – white/silver or coral – gets your vote? Let me know in the comments…! P.S. If you want to see everything I’ve worn at a glance, check out my Outfit Gallery page! These shoes & your jewelry are amazing!! I have a pair of black patent, brown and silver pair of brogues, they are just great timeless shoes. You cannot say that one pair of brogues is better than the other. You just use them with different outfits. Thank you Steff – though be careful, you may end up like me (about 13 pairs and counting)…!! Love the coral brogues , the gold jewelry with the neutral look is so complimentary too! I finally bought a chambray shirt and it is great to see how everyone styles it. Lovely! This is like asking a mother to choose one child over the other! Both pairs are fantastic. I love all things shiny, and I love colour. The orange is a contrasting colour to the orange, adding interest to your outfit that the white & silver wouldn't do. Those are on the other hand very eye-catching on their own, adding glamour to any outfit! Why choose when you have them both? Isn't this what you Brits call "having your cake and eat it"? Or the best of both worlds, shine and colour! 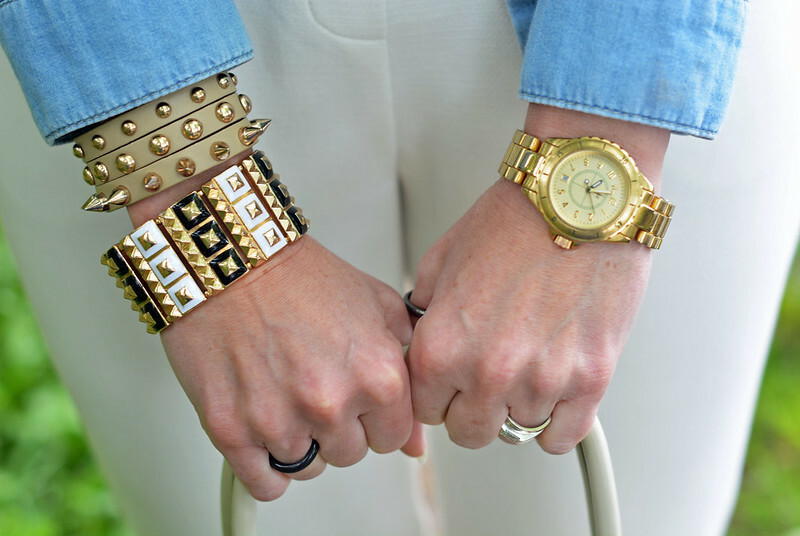 Thanks Gareth – you know when it's nearly summer because all the bloggers are getting their arm parties out…!!!! Definitely the White & Silver pair. I'm very much a magpie.